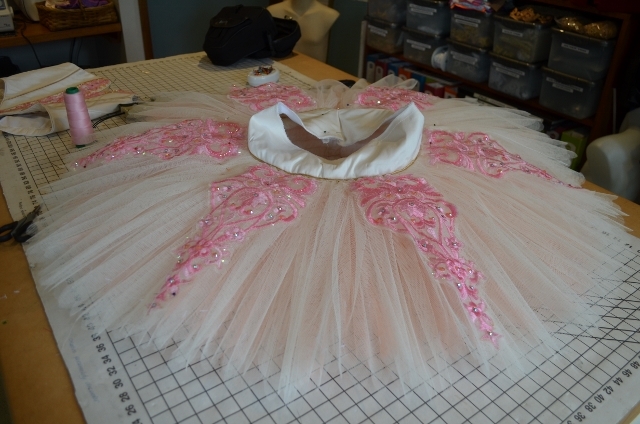 This last half of the tutu year has been pink! 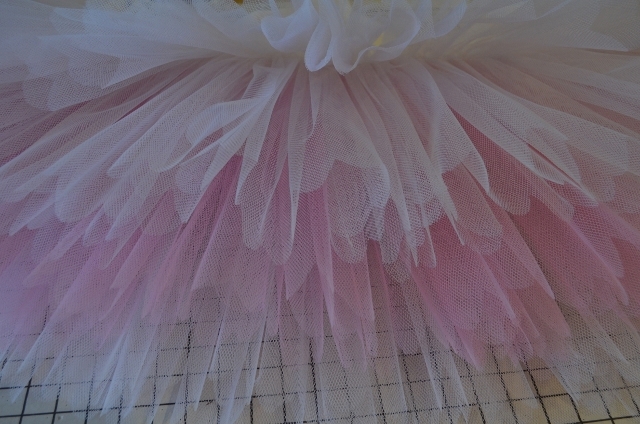 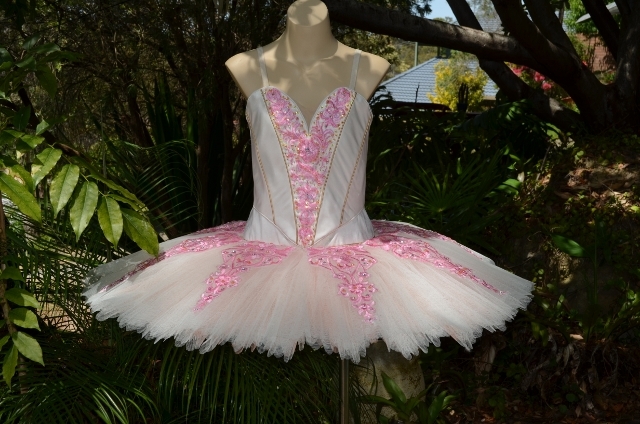 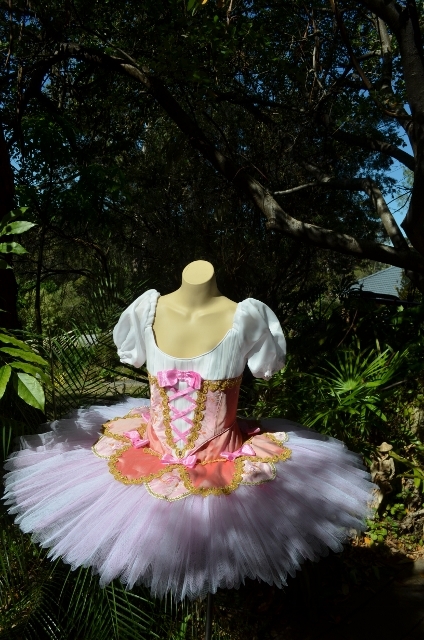 This lovely tutu has a slight twist with the introduction of some apricot to warm up the pink a little. 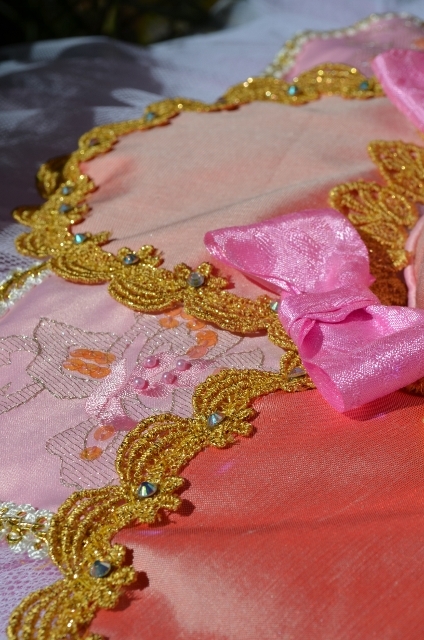 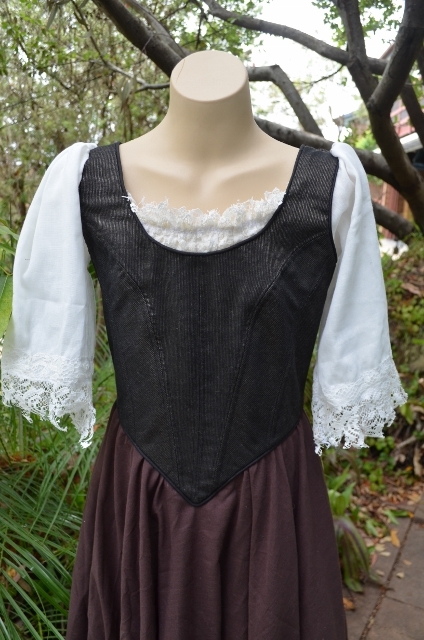 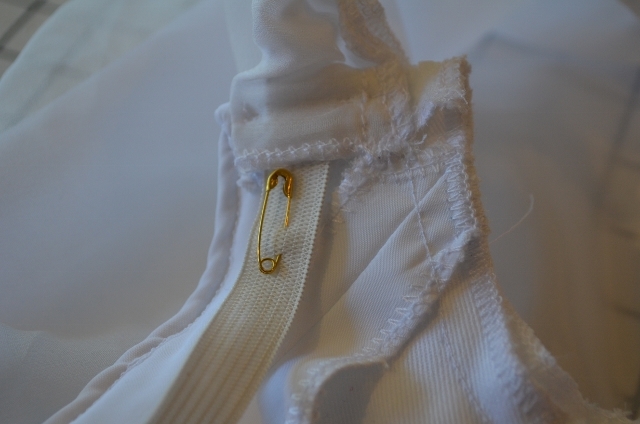 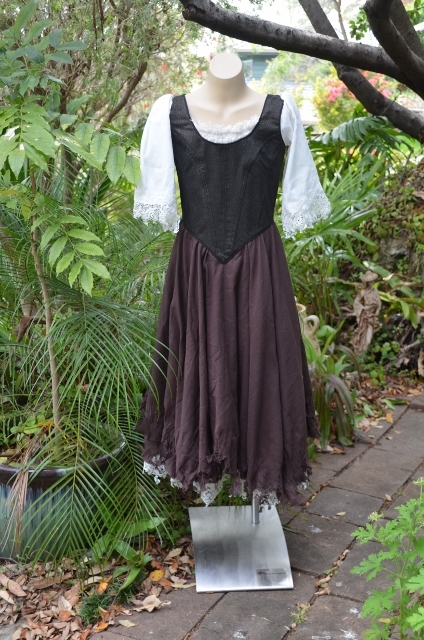 The bodice fabric is a lovely crisp Thai silk. 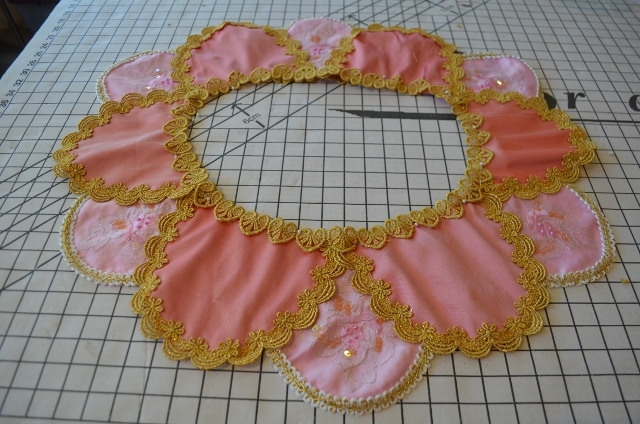 I’ve used Suzanne Dieckmann’s girls tutu bodice 3102. 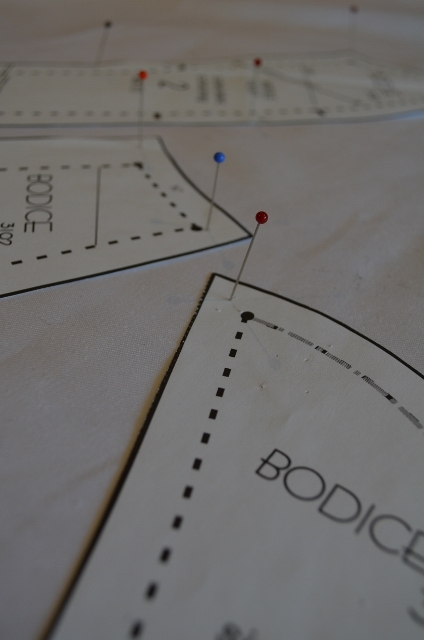 I pin my patterns to my cardboard grid so I don’t get any distortion when cutting. 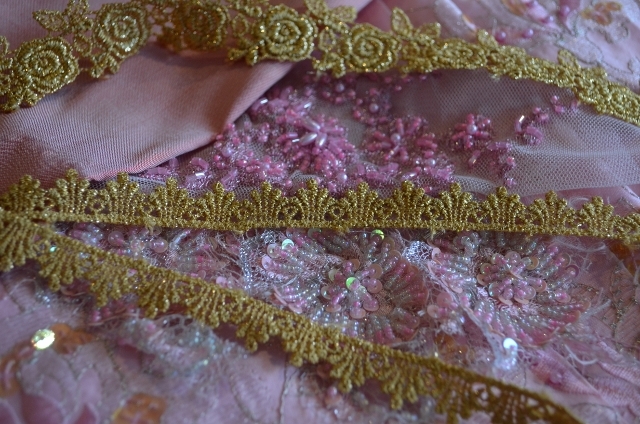 I started blinging up the embroidered net first so the glue could dry while I was making up the bodice and cutting the net. 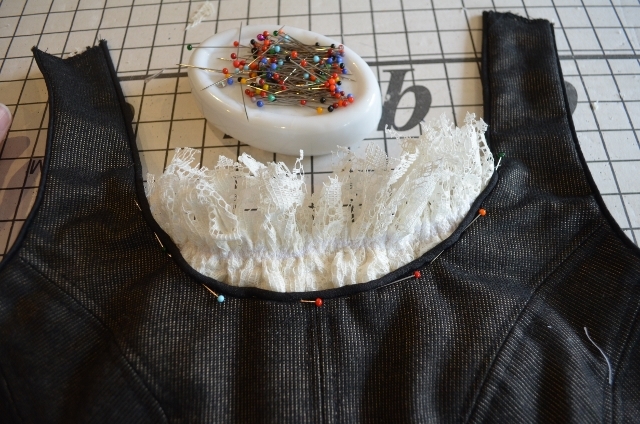 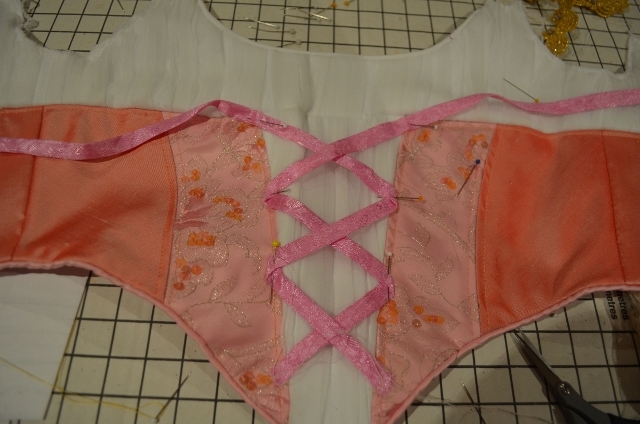 Because this is a child’s bodice I have only boned the front seam. 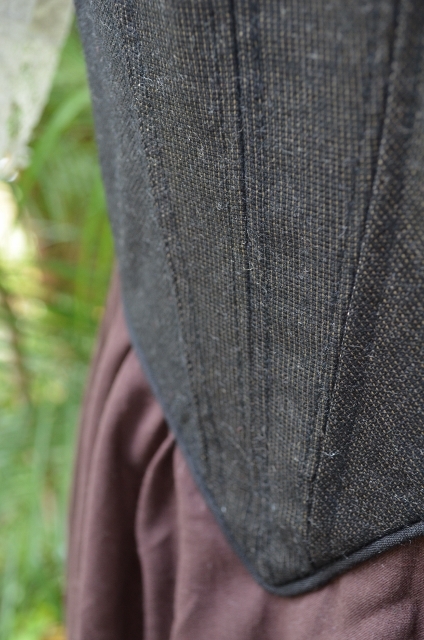 I like to use spring steel for this. 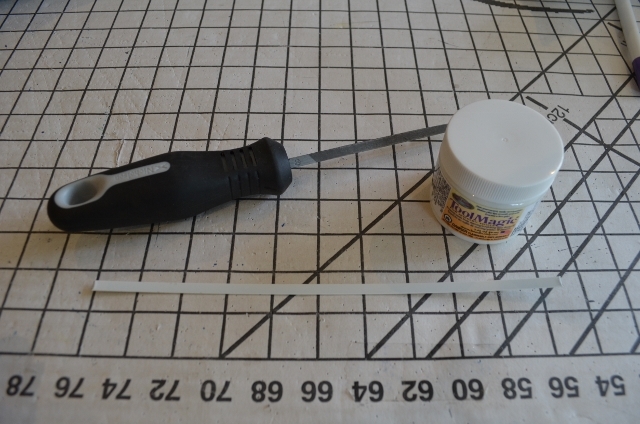 I cut a piece to size, file down the corners so it won’t puncture the boning casing and dip it into tipping fluid. 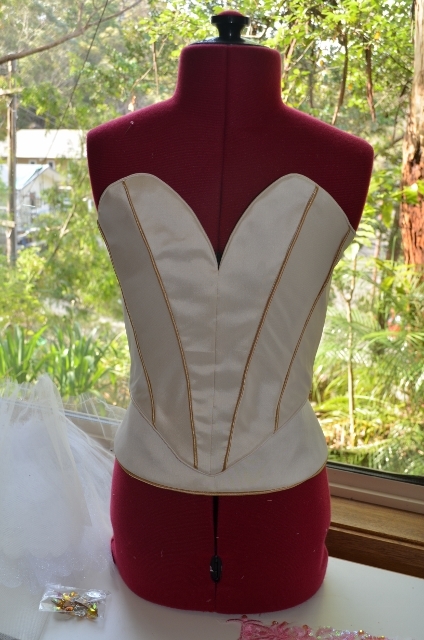 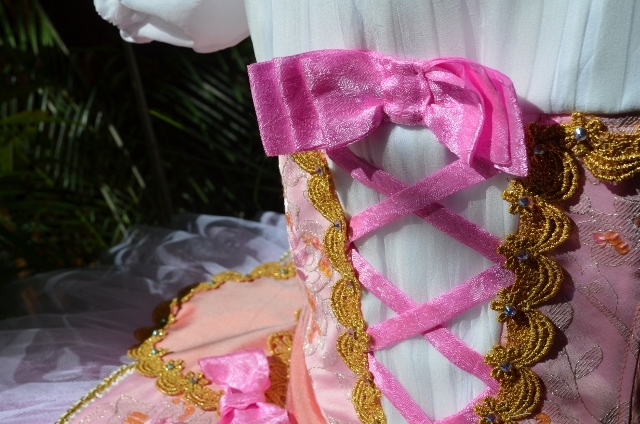 Next step was to sew on the bodice decoration. 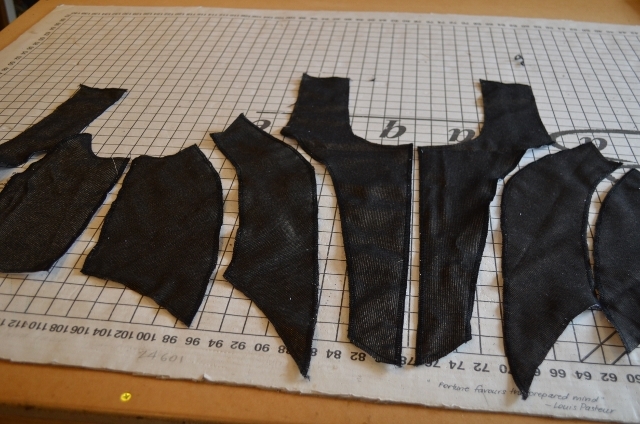 I’m really getting the hang of taking trim that has no mirror image and tricking the eye into believing it has. 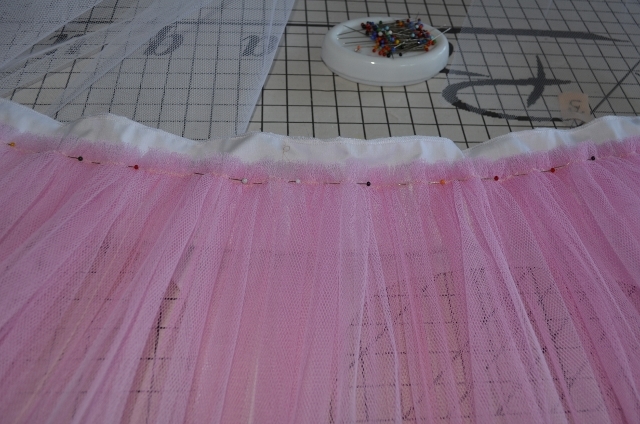 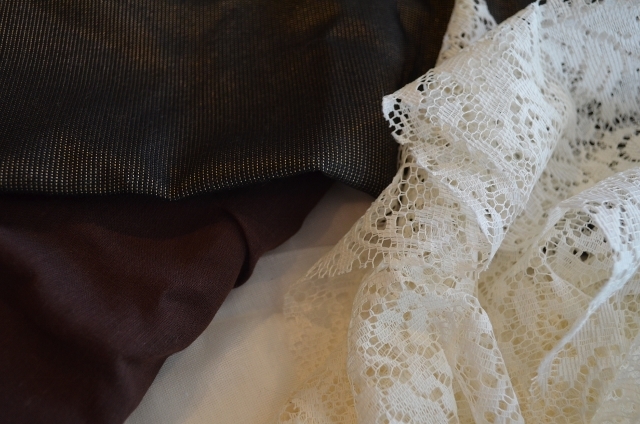 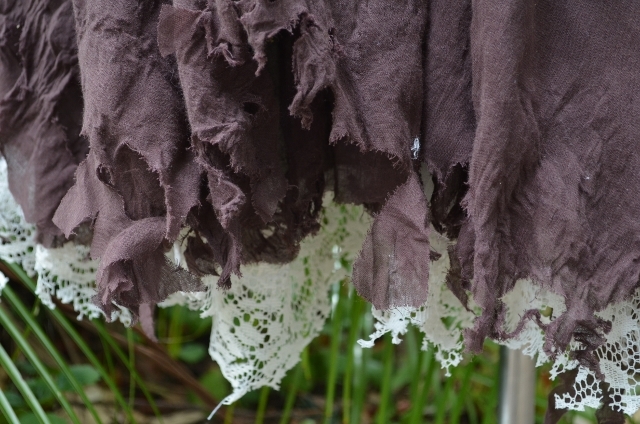 The skirt is all ivory except for a blush of apricot in layer 3. 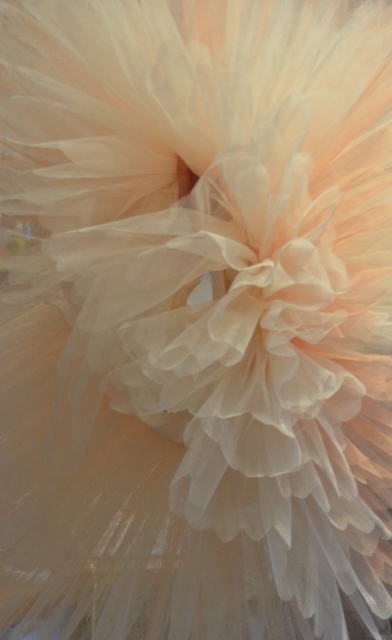 While the apricot colour is quite strong and very clearly not pink it is beautifully diluted by the ivory net to give a soft blush to the skirt. 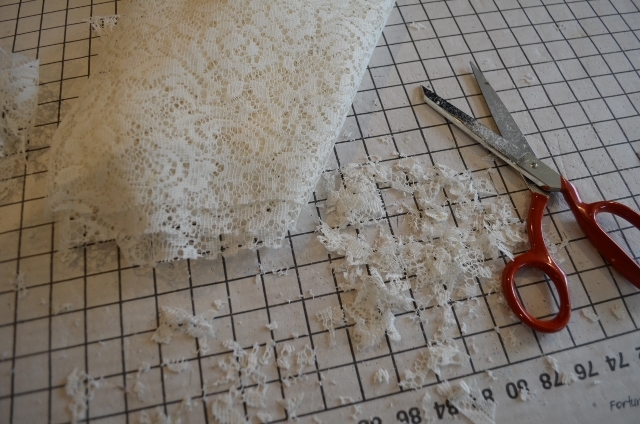 look at the photos following to see how it quietly blends with the ivory. 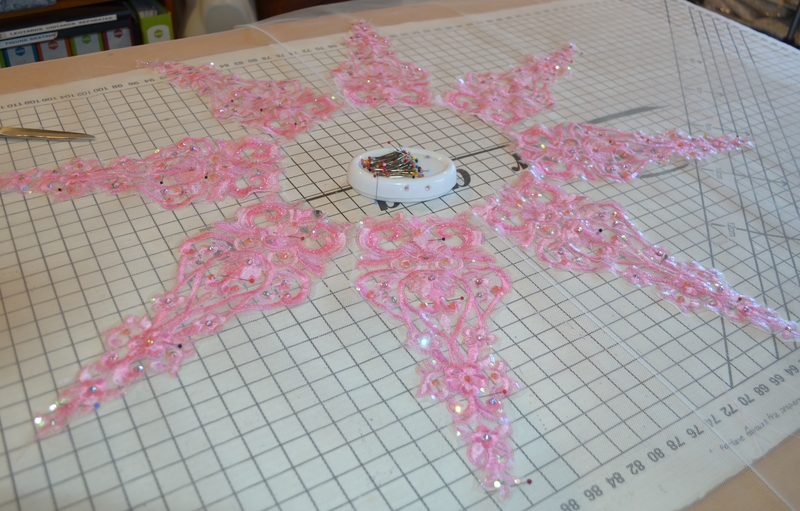 My first attempt at the plate used 6 large pink appliques. 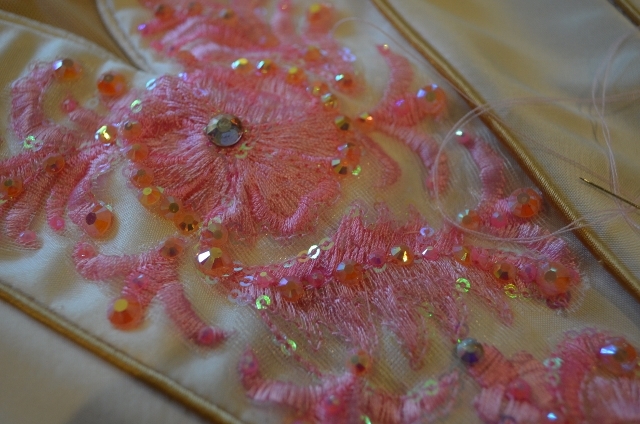 I sewed them to ivory net and then clipped around them. 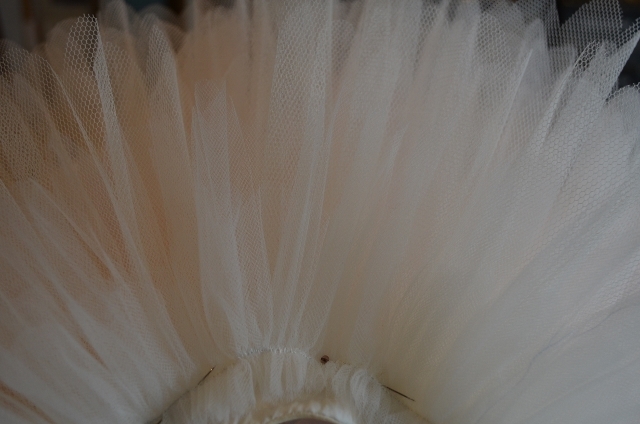 I wasn’t happy with this placement. 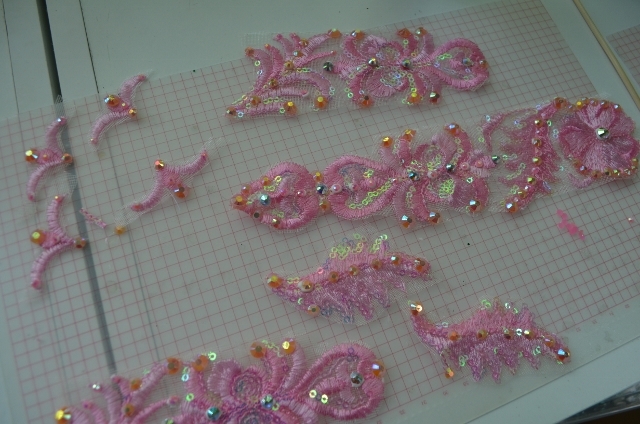 I thought the design was too sparse. 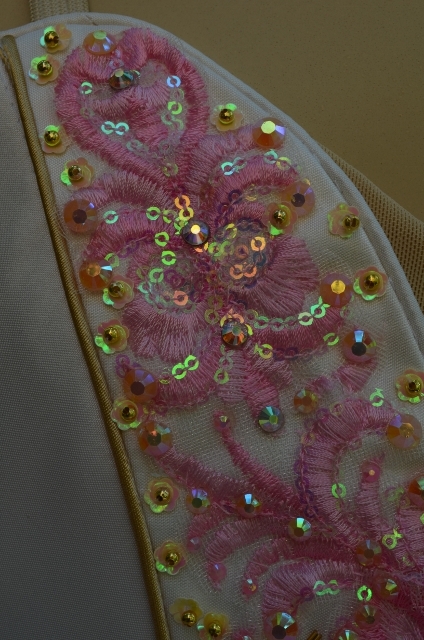 I found 2 more appliques, blinged them up and had to wait a few hours for them to dry before I could have a play and see how the plate looked with 8 points. 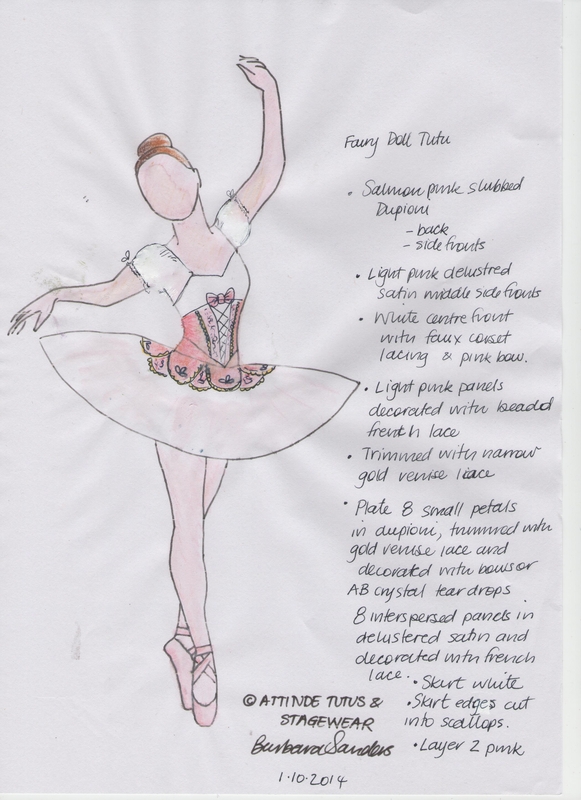 I was much happier with this design. 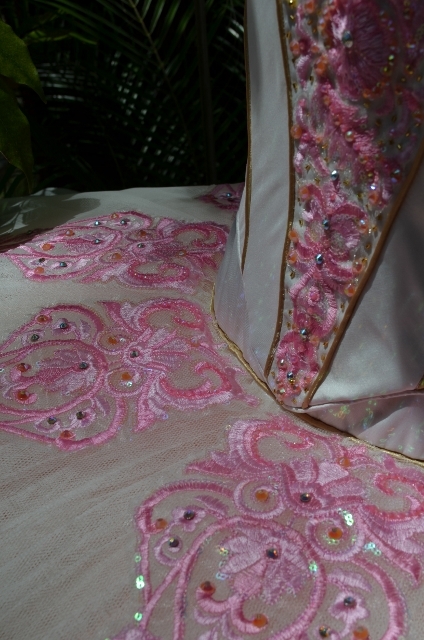 For this design I left the net plate covering the skirt and trimmed the edge into scallops to blend with the skirt layers. 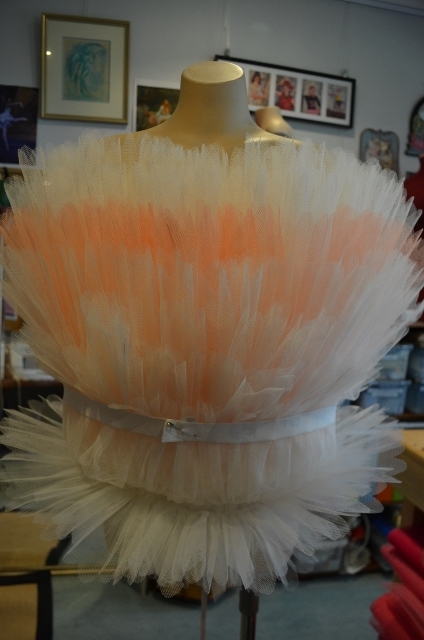 And here is the finished tutu with apricot and pink sitting happily side by side. 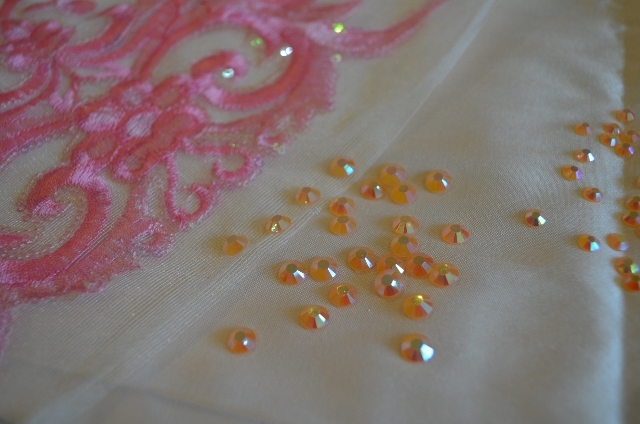 The skirt has a lovely soft blush of apricot from above and a flash of stronger apricot underneath.